The key to completing any project or reaching any goal is to work on it in a focused and organized manner. The better the planning, the better the completed project. 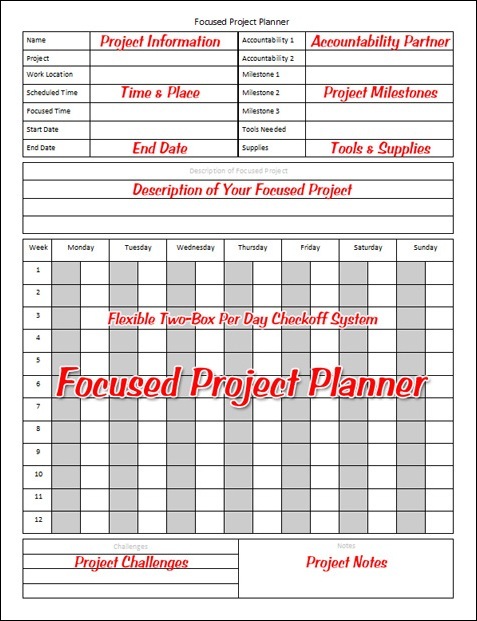 With that in mind, I would like to introduce the first draft of our Focused Project Planner using our F.A.S.T. system to help you reach your goals quickly. The planner is a free download and comes in two formats. One is completely customizable in Microsoft publisher and the other is a print only PDF version that you can print on any machine that has Adobe acrobat reader on it. The planner is based around a twelve week time frame, but can easily be expanded with multiple sheets. There is a place for project title, work location and timeframe along with our focused work time, accountability partners, and project milestones. Why not download the template today and give it a try. Stay tuned over the next few days as we put the FAST system planner through three different planning challenges.